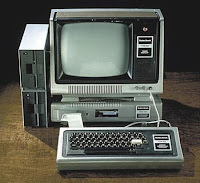 BareGeek: When is a Computer Old? To make the comparison valid, your laundry would get physically larger every time you wash it, food would take longer to cook every month and roads would have to get steeper by the day. It is less about what is actually in the computer and more about what the computer does. You do not actually use your computer, you use the internet and programs through your computer. These programs are constantly being updated and evolving. Web technologies are growing and operating systems are getting more powerful and easier to use at the same time. Even if you use only one or two programs, they are probably being updated and new versions are coming out almost every year. While your computer can degrade and break down over time, the bigger problem is that the job you are asking it to do is getting harder every day. No other machine in your house is being tasked with keeping up with so many changes. If you want to make an accurate comparison, a computer would be more like a road atlas. Compare each year of a computers life to about 5 years of road atlases. On a computer, the roads would be the programs that you use. An atlas from the year 2005 would work well for most people. It might be missing some roads in newly developed areas, but it would work. An atlas from 2000 would still be good, but their might be entire developments missing. An atlas from 1995 would start to get difficult to use. Exits might be wrong on highways. An atlas from 1990 would be missing even more roads and so on. Eventually, the atlas would be so out of date that it would take you a very long time to find your way anywhere. Even if you stop to ask for help, someone might not even be able to point out a good route on your map. If you call the atlas company for help, they would probably only suggest that you buy a new Atlas. OK, so the last part might be a stretch, but you get what I mean. The second way that the Atlas reference works in in the person driving the car. If you are set in your ways, and know your way to the places that you often go, you would probably be alright with an Atlas from 1990. However, if you are ready to take a trip to a new area, you would probably want to get a new Atlas. On the other hand, if you are a delivery man that drives for a living, you would want to keep track of the new roads and update your Atlas more frequently. The point is, because everyone uses their computer differently, the point at which you should look to upgrade your computer will vary. The absolute earliest most normal people would probably be looking for a new computer would be 3 years. The maximum I would recommend would be 6 years. At that point, your computer will most likely run slow for even the most basic of tasks. Most of the programs that are being sold will likely not run well on your computer, if they even run at all. Even though it is "still working" it will cause you much frustration and it will be unreliable. The good news, as that computers are always coming down in price and even the most basic of new computers can handle email and web browsing. The last piece of advice I would have would be to not give your old computer to a family member that wants to learn how to use one. Keeping it around the house for the kids to use and abuse is one thing. In fact, that I would encourage as it will keep the little monsters off of the nice new computer. If someone has a serious desire to learn how to use a computer, the best investment they can make is in a new computer. Spending money can be a very motivating factor to learn how to use something. Also, if you did not want it anymore, why would it be a good idea to give it to someone to learn on? If someone cannot afford to purchase a computer, by all means, please give them your old computer. If someone wants to learn and can afford the $300 - $400 for a basic new computer, encourage them to make the investment as it will make things much easier for them. Newer technologies tend to be more intuitive, so they are actually much better for learning everything for the first time. In the end, like most things with technology, the decision is yours. As long as you remember it's an atlas and not a dishwasher, you can't go wrong.